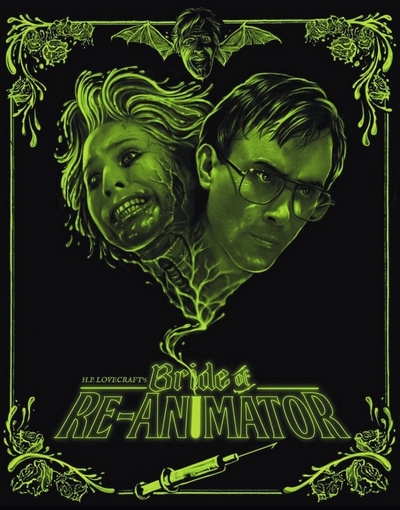 Arrow's release of Bride of Re-Animator contains both the unrated version of the film and the "R" rated cut, housed on separate discs. Bride of Re-Animator was restored in 2013/2014 using the best elements available to achieve complete presentations of both the R- Rated and Unrated versions of the film. • Brian Yuzna Remembers Bride (9:37) is a fun reminiscence by the director, who gives a brief but detailed accounting of some background information. There are some enjoyable candids included. • Splatter Masters (14:39) focuses on the SFX, and includes interviews with Robert Kurtzman, Screaming Mad George, Tony Doublin and John Buechler. • Getting Ahead in Horror (23:50) features archival behind the scenes footage. -- Meg is Re-Animated (8:04) is actually a kind of "making of" detailing this sequence. -- Carnival Sequence (2:03) features audio of the cast and crew talking about the sequence playing out under stills.